Make Michael smile like this on his birthday! Photo by Monica Silva. Right now, Plan B is in the final stages of completion, and I'm very pleased to say that it has been running smoothly and those involved have been 110% supportive. 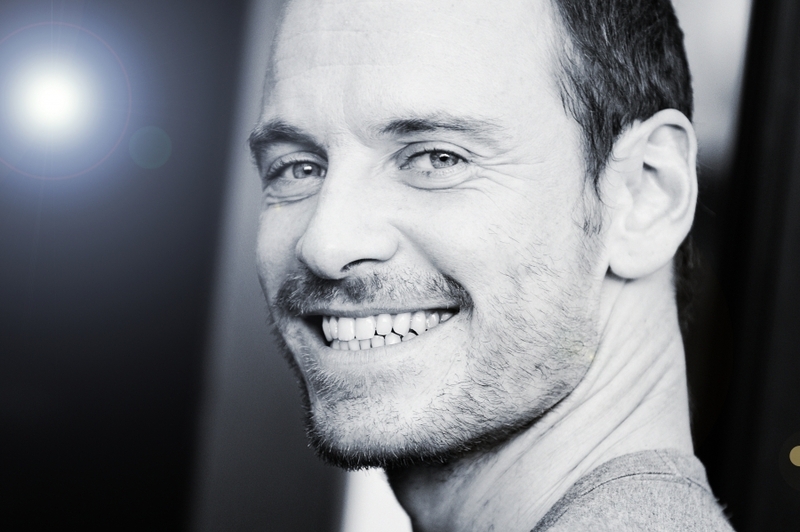 As I mentioned a few weeks ago, I would like to give other Fassinating Fassbender readers the opportunity to contribute their personal Happy Birthday wishes to Michael as I send this package off to his London agency in a couple of weeks. The Plan B project only needed a small portion of participants to donate funds to help purchase the gift, that is why I had to abruptly cut it off due to unexpected high interest. But I want to let you all know that this gift, will be from all FF readers, and I would like to welcome you to email to me, your birthday message to Michael. I will gather all messages from those who submit them, and copy them onto Happy Birthday stationery that I purchased. Please keep the messages brief and clean - you may include your name and location if you like. Please email your Happy Birthday Michael messages to me at simonetvc@gmail.com by March 15th, and I will let you know I received it and add it onto the special stationery. Michael came off an unprecedented successful year, and a stressful award season, so we all would like to make his 35th birthday on April 2nd extra special! April can't come soon enough! Simone,this picture is wonderful! It's my favourite one (even if I love all of them, of course!). I've been writing my birthday message in my mind for hours but I find it VERY difficult to write such a message to a guy you love and admire. I'll try again! Hello Simone! Is my first time in your blog and i have to say that is amazing! I love your dedication and support to Michael, who i've supported for many years too. I know, i'm late to participate in the first part of ``Plan B´´, but now, can i send you a Happy Birthday message to Michael? Thanks for all, you're doing a good job!! Hello Tania, please email to me your birthday message for Michael and I will be happy to include it. I read somewhere on tumblr that somewhere another person saw Michael with Nicole just like a girl asked if this evidence is so far no answer (we live in an era where everyone has a camera phone and not a single photo, if I saw Michael is the I once took a picture). It's like a dumb telephone, someone somewhere probably saw him standing next to some girl and they were already once to Nicole, each additional person adds something from each other, but what are people doing it. Preference is given to the curious gossip searched the forums and there is no mention of this (sooner I would have expected such rumors on them than on the ordinary people). I'm sorry but I had to complain. Simone you're right you believe in the rumors they spread them. @ émilie - good luck with your birthday message to Michael. Just speak from your heart. I have rec'd some messages already, and they all are very different, and very nice. Simone, just have too lush Fassinating Imaginations, but oh well they were and are like that. Has anyone already seen Haywire? In my country Haywire will be released only in April...can you imagine that? i don't believe the "rumor" either. i agree, a photo would have def been taken if it's true. although if it were true, nicole is someone who i would be happy to see michael dating. if he tho in fact does has a girlfriend i doubt he'd "hide" her- i mean in the past, he's been pretty open with taking his ladies on the red carpet and being seen with them off the red carpet as well. Katrina I looked at your twottera, and I wonder if you believe this person? iwannabemrsmichaelfass agree with you if he is sure that her show, but as soon Zoe does not show up for this may be that, together, visited the red carpet he promoted X-Men, but the predecessor show, maybe Zoe was ashamed. It's the first time comment to you. I'm Japanese so my English is poor,sorry. Can I send to you that "Happy Birthday Michael" Message? Can I send to message with URL? Because I draw a picture of Michael. I'm always carrying out gratitude and impression to your support to Michael. Hello Kyoko, yes, I'll will add your url to the message. Thank you! Just email it to me. Hi Simone! Just send you an mail with my Happy Birthday message to Michael. I hope all is ok! On Thursday,March 8, the Genie Awards will be broadcast at 8pm. It's Canada's version of the Oscars. Michael is up for Best Actor in a Leading Role for "A Dangerous Method"! Viggo is also nominated in the Supporting category. The film racked up 11 nominations including best pic. I have no idea if Michael or Viggo will attend the ceremony. Michael stands in very good company so if he wins, what a bonus! I thought I'd might pass this on since award season is not quite over. I agree, it's very cool to have their presence in Plan B! I just wish more would post here at FF.